Former President Harry S. Truman was reportedly the first person to be enrolled in Medicare and to receive the first Medicare card. It was issued to him in 1965 by President Lyndon B. Johnson, who had signed the hard-fought legislation authorizing Medicare into law in July of 1965. Applying for Medicare has since become somewhat of a rite of passage for seniors nearing 65 who wish to take advantage of its hospital and medical insurance coverage. Well over 67 million Americans are now enrolled as Medicare beneficiaries — a number projected to grow to about 93 million by the year 2050. 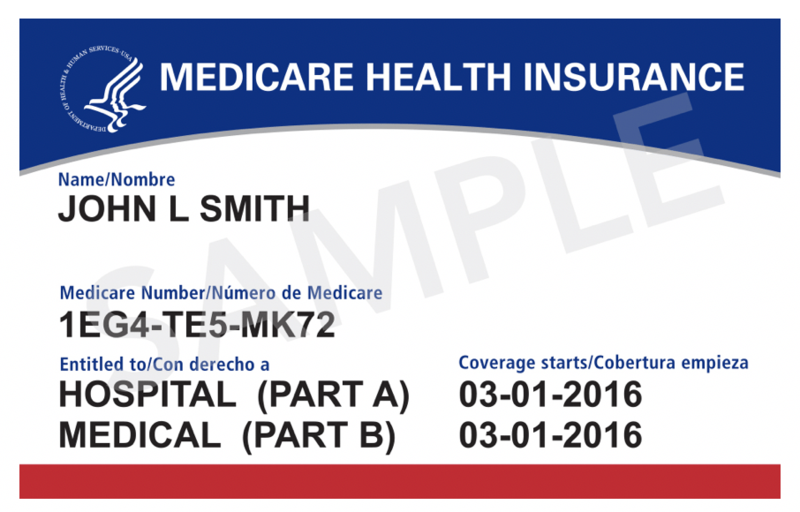 The ubiquitous red, white and blue-hued cards issued to enrollees and required by healthcare plans and providers and some federal agencies for processing claims and determining benefits, have recently undergone some subtle but essential changes: the SSN-based HICN will be replaced by a new MBI. That’s government-speak meaning the new cards will contain 11 randomly-assigned digits, or a Medicare Beneficiary Identifier to distinguish each beneficiary; the old cards contained Health Insurance Claim Numbers based on each individual’s Social Security number. And unlike the old cards, the new ones will not indicate the cardholder’s gender or contain a line for the cardholder’s signature. They will also be printed on regular weight paper, intended to be easier to copy than the thiker card stock used in the past and to allow cardholders to print their own replacements if necessary. But only the look of the card and identifying information is new; Medicare coverage and benefits will stay the same. The Centers for Medicare & Medicaid Services (CMS), the agency charged with administering Medicare, began mailing the new cards on April 1, 2018, beginning with residents who live on the east and west coasts, according to a roll-out schedule recently released. Each spouse in a married couple should receive a unique card. The deadline for replacing all Medicare cards is April 2019. To ease the transition from old to new, which hidebound healthcare providers and government agency personnel grumbled could be wonky, there will be a 21-month period — April 1, 2018 through December 31, 2019 — during which either the old or new numbers can be used to submit and process claims. Beginning on January 1, 2020, only the new numbers will be accepted. CMS is also finalizing a “secure look up tool” which will allow medical providers to access Medicare beneficiaries’ identifying numbers at the spot — a feature that is already being heralded as a huge help in avoiding delays in filing and processing claims. An estimated 58 million new cards will be mailed out to existing and new beneficiaries during the roll-out — and the cards should arrive automatically; consumers need not request them or reapply. The only action that may be required is to make sure your address is current in official records. You can update your address with the Social Security Administration either online or by calling 1-800-772-1213. As soon as you receive a new card, you can safely destroy the old Medicare card. Both the old and new cards carry a no-nonsense directive right on them: “Carry your card with you when you are away from home. Let your hospital or doctor see your card when you require hospital, medical or health services under Medicare.” Dutiful consumers usually complied, making a Medicare card a staple in nearly every senior’s wallet. But the old cards, containing Social Security numbers, signatures, and indicating gender, presented fraudsters with a treasure trove of information too good to ignore. They increasingly targeted seniors in identity thefts used to bilk them out of money and damage their credit and their lives. The Department of Justice reports an uptick of such incidents among seniors increased from 2.1 million to 2.6 million between 2012 and 2014, the last year statistics were available. Medicare administrators were slow to heed the cries. It wasn’t until April, 2015, when President Barack Obama signed a bill to eliminate the numbers that the urging became a reality. It was something rarely seen today: a bipartisan effort, as Representatives Lloyd Doggett (D-Texas) and Sam Johnson (R-Texas) together spearheaded the effort. They were motivated by fear, especially after a data breach at mega-insurer Anthem exposed an estimated 80 million consumers’ personal information. “The Social Security number is the key to identity theft, and thieves are having a field day with seniors’ Medicare cards,” Johnson told The New York Times just before the bill was passed. They ask for your Social Security number and bank information so you can get the new card. In truth, Medicare will never call you and request such personal information. They ask you to send money to pay for the new card. The reality is the card is free. They tell you that you risk losing your Medicare benefits if you don’t give them money and personal information over the phone. The free card will be sent to you automatically, and your benefits will remain the same. In all cases, the FTC’s unequivocal advice about handling such calls is the same: Hang up. The agency also provides online assistance for reporting suspected Medicare scams. A Change in Habits – Warning! Is It Time to Call Hospice In for Daddy?